The United States is now the top source of spam, accounting for almost 19 percent of all junk e-mail sent throughout the world, according to a new report out today from Sophos. 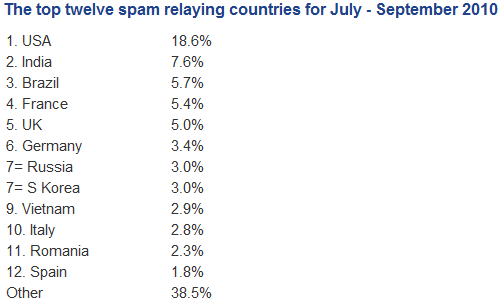 The security firm's "Dirty Dozen" report highlighted the top 12 countries responsible for the world's supply of spam during the third quarter. With the United States generating almost 2.5 times more spam than second-place India, the country now accounts for almost one in five junk messages. The United States' 18.6 percent share of all global spam also showed a significant jump from its 15.2 percent share in the second quarter. 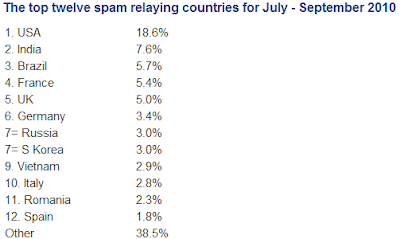 Among the other top sources of spam, according to Sophos, are India with 7.6 percent of all global junk mail, Brazil with 5.7 percent, France with 5.4 percent, and the U.K. with 5 percent. The report also highlighted the growth in spam from social-networking sites over the third quarter. Last month, Twitter users were hit by a "MouseOver" exploit that redirected them to third-party spam sites if they simply hovered over a link in a tweet. And over the summer, Facebook users faced their own scams, ones that attempted to trick them into filling out bogus surveys, with the information then used to spam their friends. Much of the spam now being generated around the world isn't coming from the spammers themselves but from botnets, networks of infected computers directed to send junk mail to other unsuspecting users. "You should never even be tempted to open a spam message out of curiosity, as it can only take a second to effectively hand over control of your computer to the spammers," Graham Cluley, senior technology consultant at Sophos, explained in a statement. "If your computer does become part of a botnet, you're also inviting further malware infections, which may compromise your personal or banking information."